We’re the first to admit that the kitchen industry has gotten a little out of control, with gadgets and gizmos for just about everything (avocado slicer, we’re looking at you). Whether you’re setting up a kitchen from scratch or going through a much-needed feng shui attack, here’s what you actuallyneed. 1. A chef’s knife. No, you don’t need the $800 knife. Yes, you do need a decent one from a reputable brand. 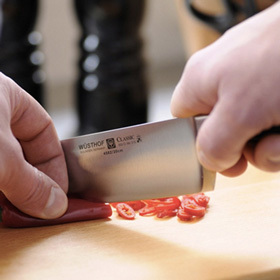 Sharpen it regularly and you’re on your way to culinary bliss. 2. A paring knife. For more delicate tasks, like peeling apples and chopping garlic. 3. A heavy, wooden cutting board. Carnivores, make sure to get two--one for meat and one for veggies. 5. A food processor. Anything that gives us freshly made hummus or five-minute pesto is essential in our books. 6. A hand-juicer. For cocktails, or for adding a hint of lemon to almost any recipe. 7. A skillet. We like cast iron--just remember not to wash it with soap! 8. A Dutch oven. The most versatile pot in the whole entire world, this guy can go on the stove or in the oven. 9. A stockpot. Hey, you’re gonna want to make pasta at some point, right? 10. A slow cooker. Those 1960s housewives were onto something. 11. An immersion blender. This handy little guy is great for any kind of pureed soup or vegetable--without taking up precious counter real estate. 12. Tongs. Your secret weapon when it comes to turning meats and veggies. 13. A box grater. Cheese, lemon zest, nutmeg….you get the idea. 14. Measuring cups and spoons. Even if you’re one of those improvisational cooks who lives by a pinch here and a pinch there. 15. Wire-mesh colanders. Bonus points for doubling as a strainer when you want to get fancy with sauces and things. 16. Rubber spatulas. For stirring and turning (and licking, when covered in chocolate). 17. A Silpat baking mat. We’d like to kiss the inventors of these genius mats, which basically function as washable parchment paper. Use them to line your baking sheets, or on the counter to roll out dough without making a mess. 18. Digital instant-read thermometer. You can poke and prod all you want, but the best way to know if your meat is done is by taking its temperature. 19. Baking sheets. How else are you going to make your Christmas cookies?